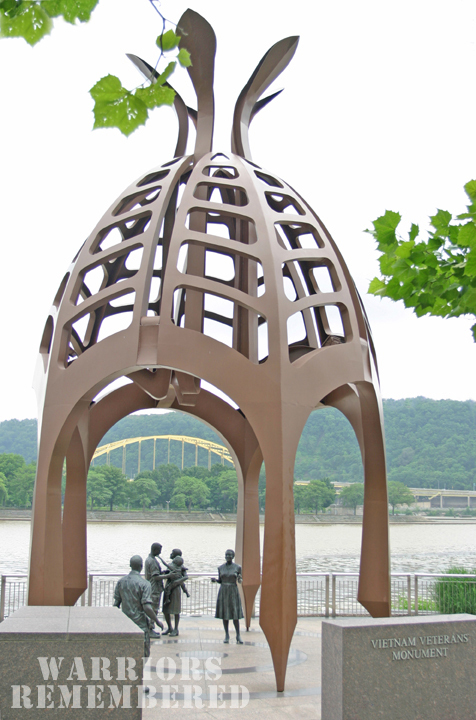 Allegheny Vietnam Veterans Monument – On the River Walk at the point where the Allegany and the Monongahela join to birth the Ohio River the Asian symbol of rebirth surrounds and protects the sculptures below it. Military veteran members of the local trade unions vied to volunteer their time and skills to construct this memorial honoring over 400 of their fallen comrades and create a safe LZ for families and those who served. A mother catches the first sight of her son after a long year of prayers. 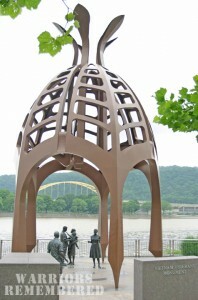 A young wife joyfully shares her son’s reunion with his father while her searching eyes wonder, “Is this man returning to me the same person I knew a year ago?” While five wind chimes sing quiet prayers in the river breeze, the memorial’s every symbol clearly says to all veterans “Welcome Home” and be at peace.